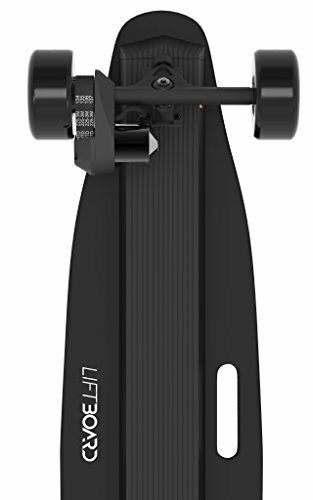 LiftBoard Single Motor Belt Driven Electric Skateboard, Black, 39"
This model is no longer available. (As of 12/1/2018). Check out the latest E-Skateboard Review article for more options! 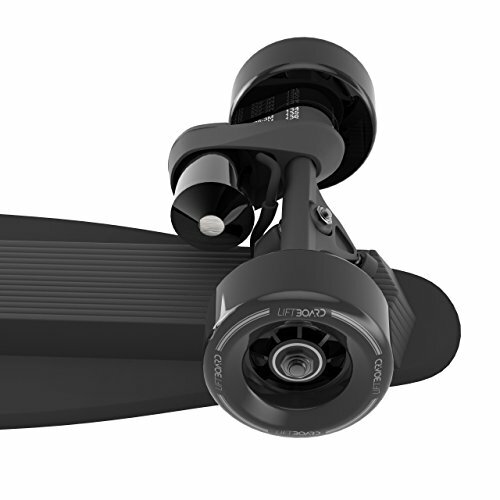 The LiftBoard Single Motor Belt Driven Electric Skateboard differs from many of the others in two major ways. Rather than having the motor mounted to the wheels or hubs, the LiftBoard uses a belt driven motor that provides great torque and power. The second major difference is the LiftBoard is the 265 pound maximum weight capacity. Most of the other boards recommend riders who weigh less than 225 pounds. This sturdy board can handle the big guys. The LiftBoard Single Motor Belt Driven Electric Skateboard is in a class by itself. This sleek, black board is 39 inches long and has a wide, rigid deck made from 7 layers of maple hardwood. Inset into the center of the deck is a rigged rubber mat to help you maintain a steady grip on the board. The most unusual thing about the deck is the cut out carrying handle, conveniently located halfway down one side. This feature is handy, because this board can be somewhat bulky to carry. It is one of the heavier boards on the market, weighing 14.8 pounds. The board is mounted to a steel, powder coated, adjustable truck with 80 mm polyurethane wheels. The wheels roll on ABEC 5 bearings, giving you an exceptionally smooth ride on most paved surfaces. This board is unique in the fact that the 900 watt motor is belt driven, rather than mounted to the wheels or hubs. This allows increased torque when traveling uphill. The LiftBoard Single Motor Belt Driven Electric Skateboard does well on hills, easily conquering an incline of up to 15 percent with no loss of power or speed. 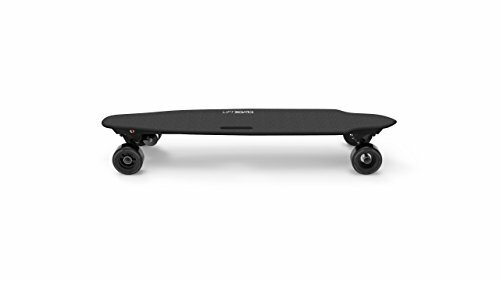 The board travels at a quick 16 mph on flat surfaces, and will travel for 16 miles before the battery loses its charge. Recharging takes a while though, between 2 and 3 hours. 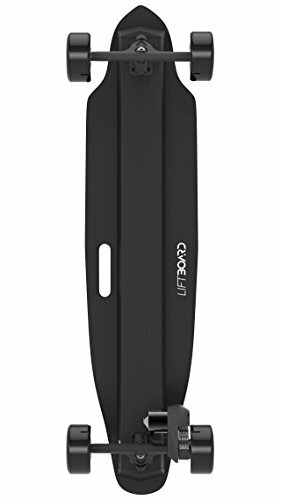 Unlike some other boards, the battery on this one is not replaceable, so you can’t carry an extra, fully charged battery with you. Acceleration, braking, and turns are all controlled by the included plastic, hand-held remote control. Some riders have reported that the remote randomly loses sync with the board while in motion, but this is easily fixed by dismounting the board and pushing the button on the remote a few times. The remote control, like the motor, takes 2 hours to charge, and you want to be sure it is fully charged before heading out because it is the only way to control this board. The manufacturer does not recommend push kicking this board because of the belt driven motor. The board features a couple of speed settings. The lowest setting is the beginner mode at 9 mph. Once you have mastered that, you can switch up to full power and hit speeds up to 16 mph. The top speed is dependent on your weight and the surface you are riding on. Overall, this board is pretty solid. The belt driven motor provides large amounts of torque for takeoffs and uphill travel. The 7 ply maple deck and steel trucks can accommodate riders up to 265 pounds. The board provides a fast, smooth ride. You can travel up to 16 miles at 16 mph, something other boards just can’t do. Because the motor is belt driven, it is easy to replace the belt or the motor if something should go wrong. Parts are available on the LiftBoard website and are reasonable priced. The battery recharge time is too long. Others can recharge in as little as 30 minutes. Also, the battery is not replaceable. That could be a big problem if you had battery failure. Another weakness is the charging time for the remote and the fact that it needs to be fully charged before you ride, because there is no other way to control this board. The size and weight of this electric skateboard make it bulky and awkward to carry. This board is strong. It has great speed, great range, and great torque. The remote lacks a little, but everything else about the LiftBoard Single Motor Belt Driven Electric Skateboard is amazing. From its well made deck and steel truck to its belt driven 900 W motor, this thing is a powerhouse. 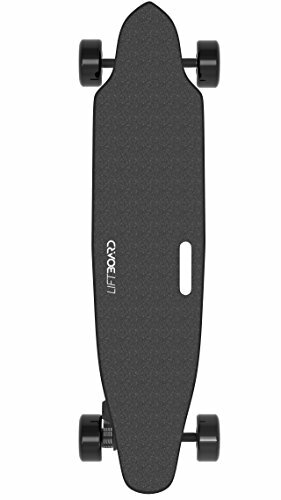 It is moderately priced, easy enough for a beginner to use, and offers exceptional speed and range. We definitely recommend this one. Need more information on the Liftboard? Download the user manual for detailed information on specs, warranty and features. I have owned two of these unit. A Jan 2017 model and a June 2017 “Updated software model”. They are both trash. The first unit drops signal all the time, causing the board to get stuck in the last signal it received. Which in my case was full speed. This cased the board to take off into an inner section, when I jumped off and was almost hit by a car and it continued on its own to the other side of the street. Second model, motor blew out in 3 months, light riding, no water. Makes a horrible noise. Stay away from these units!